Home Health Notes What Is Dupuytren's Contracture? 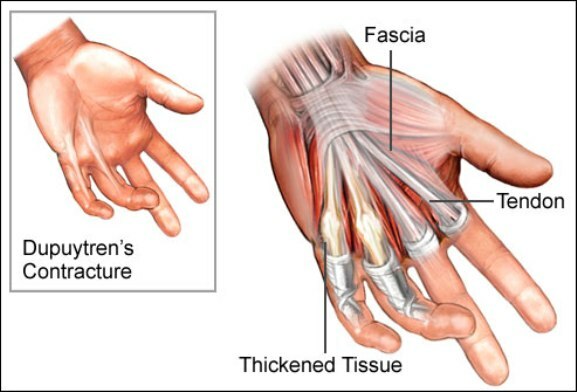 Dupuytren's (du-pwe-TRANZ) contracture is a condition that gradually causes connective tissue (fascia) under the skin of your palm to thicken and become scar-like. Although Dupuytren's isn't painful, it does restrict movement. The thickened tissue forces several fingers - usually your ring and pinky fingers - to curl in toward your palm. The bending caused by the thick tissue is called contracture. As Dupuytren's permanently bends fingers into a fixed position, it can become difficult to grasp large objects and make simple movements like washing your face or putting on gloves. The condition shouldn't affect your ability to write and grasp small objects, though, because the thumb and index finger usually aren't affected. Although reports of Dupuytren's contracture first appeared in medical literature in the 1600s, doctors still don’t know what causes the scar tissue to form. The condition tends to run in families, so genes may be involved. 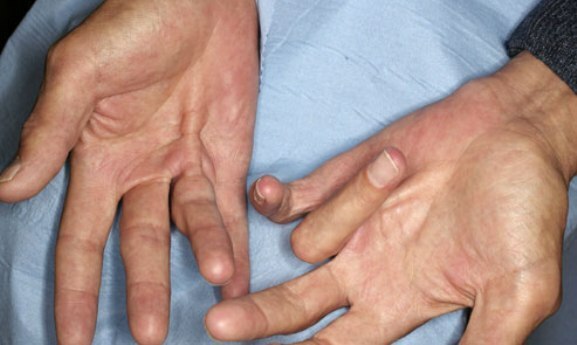 Dupuytren's is more common in middle age, especially in men of Northern European descent. Alcohol and tobacco use, diabetes, and epilepsy also increase the risk. First, the skin on the palm of the hand starts to thicken. The skin might appear puckered as knots (nodules) of hard tissue begin to form on your palm. These nodules might feel tender to the touch, but they’re usually not painful. The skin thickening happens very slowly, and may take many years. You don't need treatment unless your symptoms bother you. The nodules of tissue on the palm gradually stretch into thin bands of collagen. These collagen bands progressively extend up, usually into the ring and pinky fingers. As the bands tighten, they pull the fingers in toward the palm and make it difficult to straighten out your fingers. Although fingers on both hands can be affected, one hand is usually worse than the other. Your doctor usually can determine if you have Dupuytren's by feeling for thickened scar tissue and seeing whether your fingers pull inward. 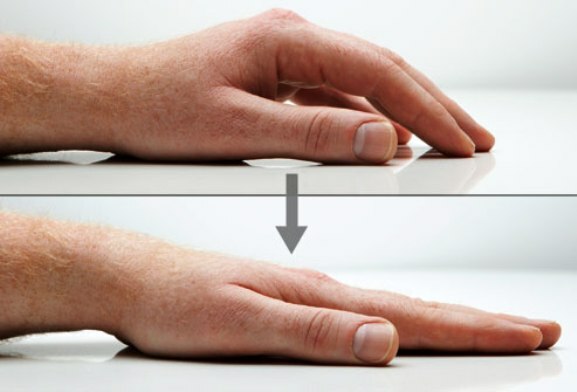 You may also have a "table top" test, in which you put your hand, palm down, on a table to see if it lies flat. If it doesn't, you may have a contracture that may require surgery. Your doctor also can test your grip and the range of motion in your fingers. Corticosteroid injections can help pain and inflammation and may slow the disease. Doctors can also inject enzymes into the palm to weaken the collagen bands. Then your hand is moved by your doctor until the bands are broken and your fingers can be straightened. Other treatments may include needle aponeurotomy, where the contracted bands are divided with small hypodermic needles. Radiation therapy is also being studied as a treatment and has been successful in several small studies. If contracture symptoms are bad enough to interfere with daily life, surgery may help. 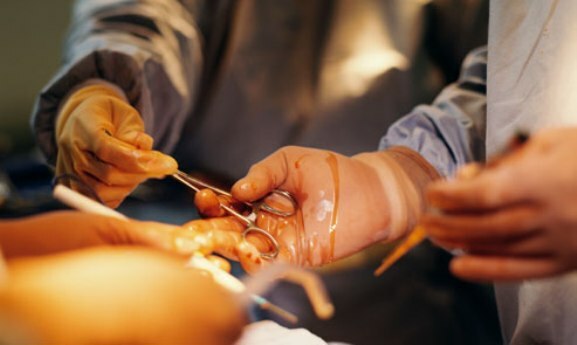 During the procedure, your surgeon removes the thickened tissue in your palm, which allows the fingers to move again. Surgery usually can give you normal movement back, but risks may include infection and nerve damage. Once your wound has healed, you will likely need to have physical therapy for a few months. A physical therapist will teach you exercises to help you regain strength and movement in your fingers. Even with a successful surgery, Dupuytren's contracture can return. If it does, you may need to have another procedure.